If you ask people what activities they enjoyed on a Disney Cruise in the Caribbean, Pirate Night always seems to top the list. At first I wasn’t sure about the Pirate Night hype, but now it is one of my favorite on board activities. 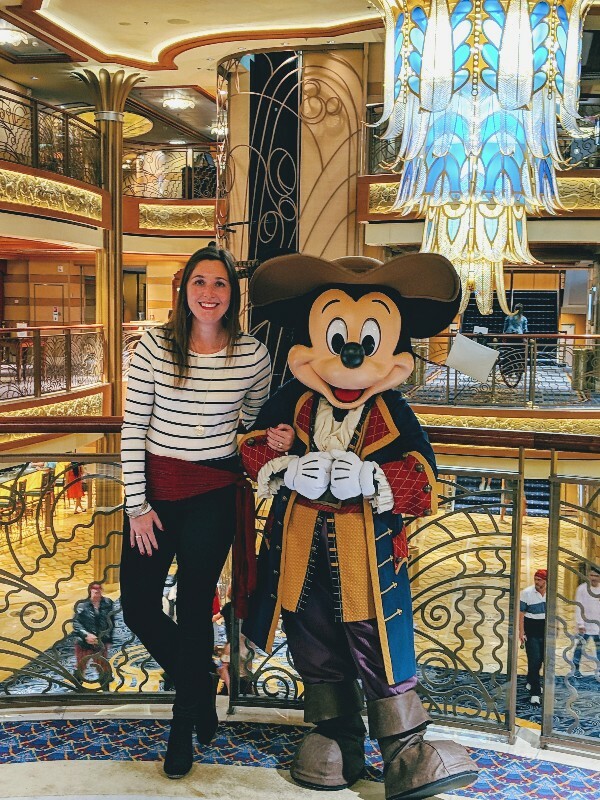 Here is our complete guide to Pirate Night with our family-tested tips so you can avoid rookie mistakes on your Disney Cruise Pirate Night. 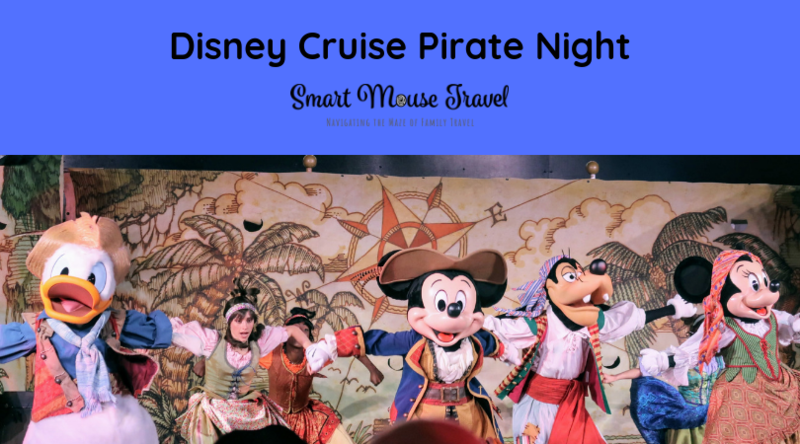 What Is Disney Cruise Pirate Night? Select Disney Cruises in the Caribbean have a special event called Pirate Night. This event is a combination of pirate-themed live shows, fireworks, a pirate makeover option, a late night dance party with full buffet, and special character meet and greets. For the cruises from Port Canaveral to the Bahamas and Castaway Cay we’ve always enjoyed pirate night on our Nassau port day. Check your exact cruise itinerary to know which night is your scheduled Disney Cruise Pirate Night. The party officially starts around 7:30PM with Pirate Games, but you can get into the pirate spirit much earlier than that with a makeover at Pirates League starting in the late afternoon. 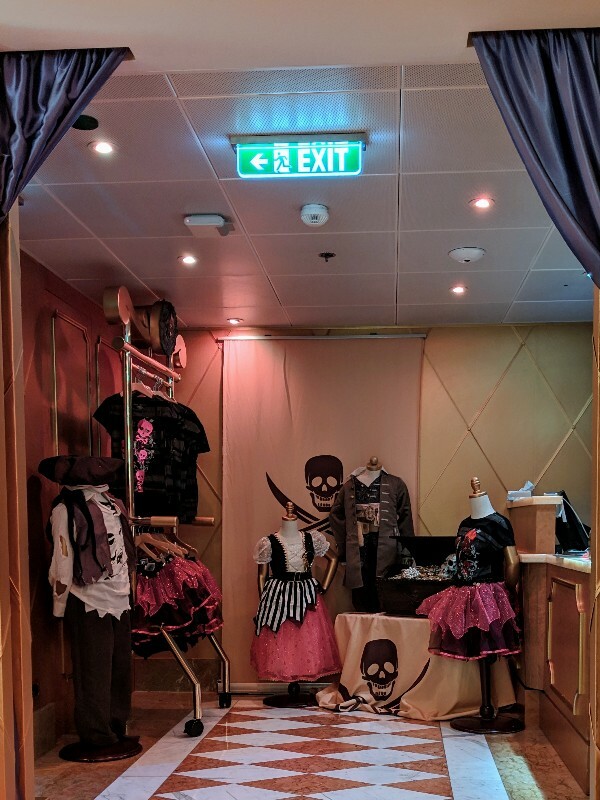 You have probably heard of Bibbidi Bobbidi Boutique for princess makeovers, but did you know on Disney Cruise Pirate Night you can get pirate makeovers? 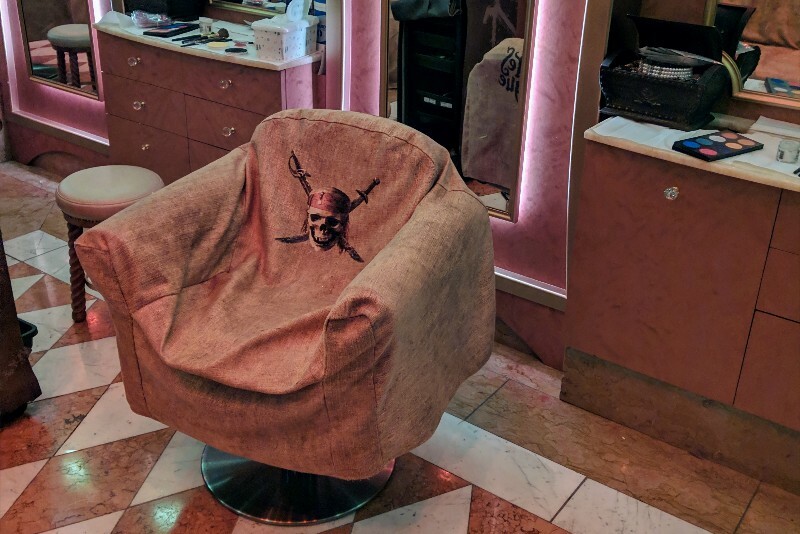 These pirate makeovers start on the afternoon of Pirate Night when Bibbidi Bobbidi Boutique is taken over by rogue pirates and turned into the Pirates League. Pirates League is for those age 3 years and older. In fact, there is no upper age limit at Pirates League. We mostly see kids, but some full families have gotten pirate makeovers for the night. The Pirates League makeover options are make-up only or make-up plus a costume. Either choice will provide your pirate-in-training some keepsake goodies. There are 3 makeover options for the boys which feature different beards and make-up. For girls there is only one pirate makeover choice. We’ve always opted to bring our own costume from home because there was only one option for a girl’s pirate costume. However, on our most recent trip I did notice they had a second costume option for girls. It wasn’t actually a costume, but a cute pirate themed t-shirt and tutu set. When entering Pirates League don’t expect a polite welcome, but that’s part of the fun. The pirates take the job very seriously and expect you to have the right swagger to join their crew. Their first task is to get you a new pirate name. You roll dice and the numbers decide what your new name will be. Then the next available pirate calls you to their chair. Here you will choose exactly which make-up option you would like. There are some additional choices to be made during the princess pirate makeover such as eye shadow, blush, nail polish, and lipgloss color. During the entire makeover your pirate stays in character and makes a big show of getting you ready to join the crew. Once you look the part you take the pirate oath. This oath binds you to the pirate crew. The take home goodies from Pirates League, other than a costume if you choose that option, are a sword, a special bandanna, your pirate oath with new name, a medallion necklace, and an eye patch. For the pirate princess makeover you also get to keep the nail polish and lip gloss. 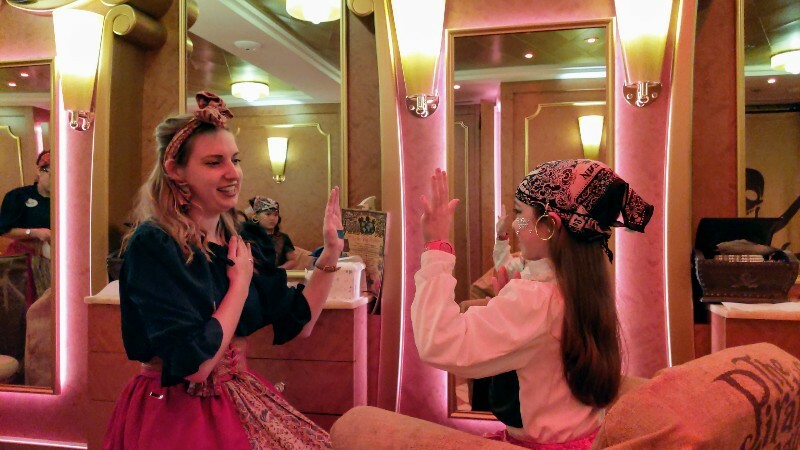 If you ask Elizabeth her favorite Pirate Night activity her answer is an emphatic “makeovers at Pirates League”, but really that is just the beginning of the Disney Cruise Pirate Night fun. 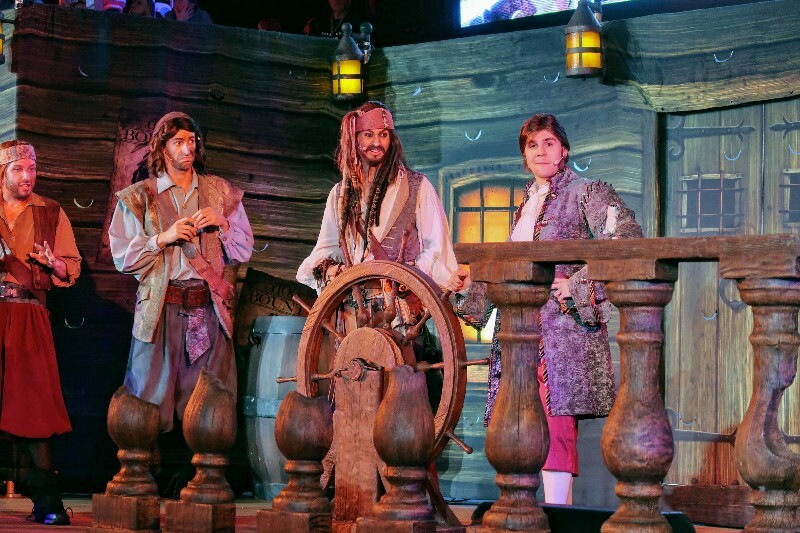 Pirate Night on Disney Cruise Line encompasses several events. There are pirate character meet and greets, two live stage shows, fireworks, a dance party, and special late night buffet. On Disney Cruise Pirate Night several characters get a pirate makeover. For example, Mickey meets guests in his full pirate outfit. You can also meet some other special pirates like Captain Hook, Smee, or Captain Jack Sparrow. Please note that the wait times for these special character meet and greets can sometimes get long. 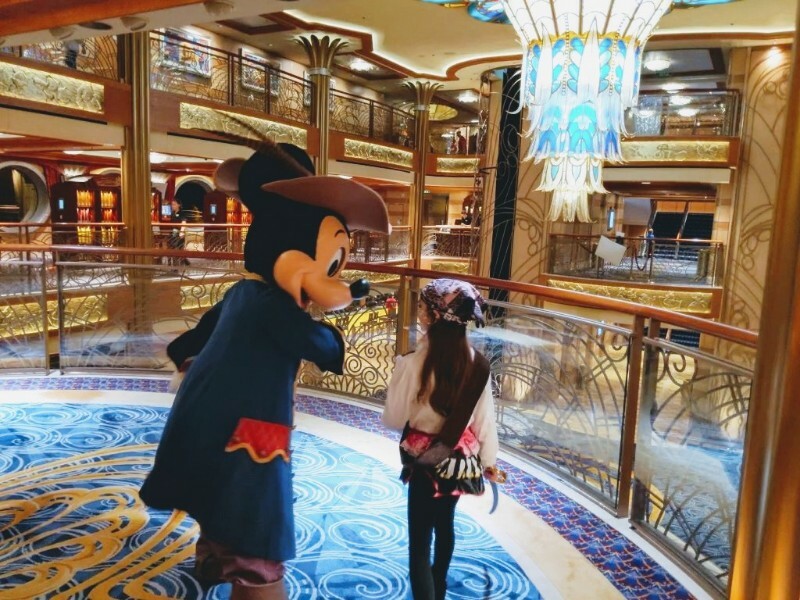 Find out more about meeting characters on a Disney Cruise in this article. The first live show of the night is Mickey’s Pirates in the Caribbean. This show usually begins at 7:45pm right after first seating for dinner is done. The show takes place on the stage in front of Funnel Vision on the pool deck. Mickey, Minnie, Goofy, Donald, and Daisy are a pirate crew looking for new recruits – you! They train you on the most important lessons a pirate needs to know with a mix of songs and activities. After your lesson, Captain Hook and Smee take over Mickey’s ship with their pirate crew. For Mickey to regain control of the ship the audience needs to answer Smee and Hook’s tough pirate questions. After Mickey’s Pirates in the Caribbean there is a short lull in activities while second dining takes place. This is a time you can try to meet those special characters or catch a show. After second seating dinner has ended the next live show begins around 10:15pm. This show also takes place on the pool deck in front of Funnel Vision. 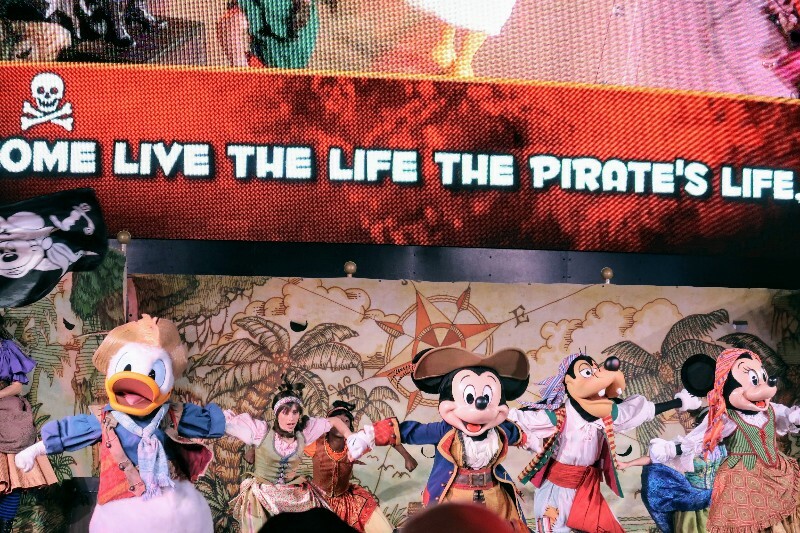 The live show has a pirate crew, including Captain Jack Sparrow, improvising silly songs with the help of the audience. The show is fun, but I don’t think it is as good as Mickey’s Pirates in the Caribbean. After the live show it is time for fireworks. For me the highlight of Buccaneer Blast is the fireworks. Seeing fireworks launched from the ship over the ocean was such an impressive sight. After the fireworks a DJ takes over the stage in front of Funnel Vision. They play a variety of family friendly dance favorites. I enjoyed dancing and being silly with Elizabeth and lots of families were on the dance floor living it up. Cabanas buffet reopens with a full special Pirate Night buffet during Club Pirate. We were still stuffed from dinner, but others were indulging on the late night meal. 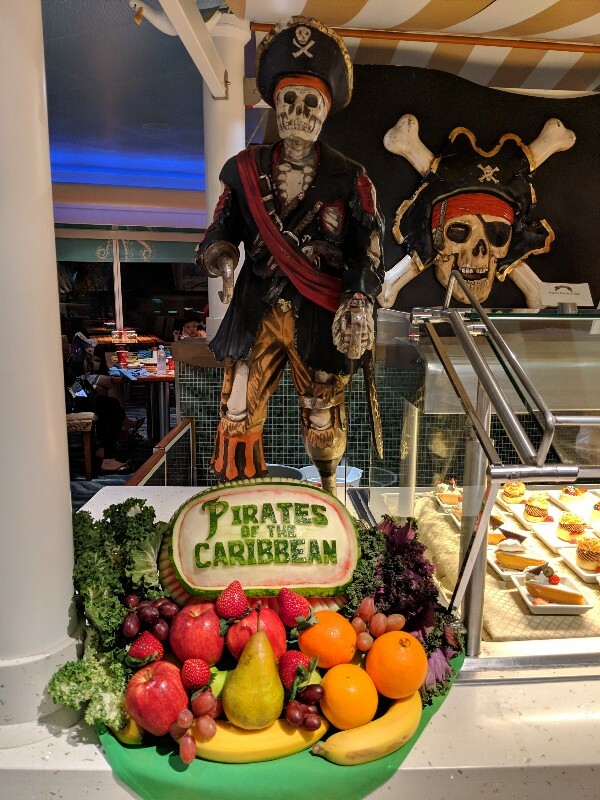 I loved looking at the pirate themed watermelon carvings and other pirate decor in the buffet line. Are Costumes Required On Pirate Night? The quick answer is “no”. This was my biggest concern about Disney Cruise Pirate Night on our first Disney Cruise. I am not really a costume person, but didn’t know if I would feel left out without one. I opted to wear regular clothes our first Pirate Night, and although it was fine I did wish I had done a little something pirate inspired. I still don’t wear a pirate costume, but I do opt for a pirate inspired look with regular clothes. On our most recent trip I used black jeans, black booties, a necklace and bracelets I already owned. I added a striped T-shirt and big hoop earrings from Target and ordered an inexpensive red scarf from Amazon that I used as a sash. This allowed me to participate in our Disney Cruise Pirate Night, but in a way I felt comfortable. If you are a costume person then go for it. There are lots of people in full pirate gear and make-up and it is awesome. I especially love to see when full families get into the costume spirit. My only rule is do the level of pirate night costume you are comfortable doing. Pirates League makeovers cost money and I think that the earlier you get the makeover the more time you have to enjoy it. 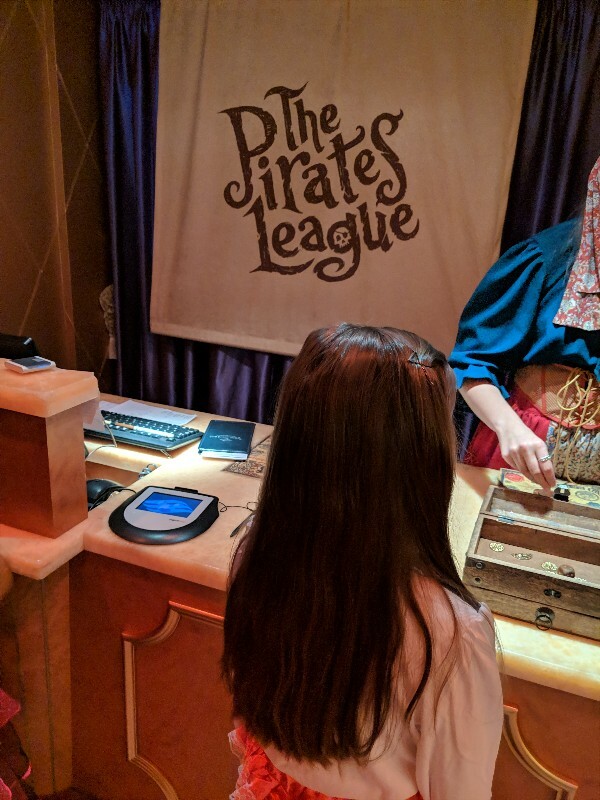 Scheduling your appointment near the opening time of Pirates League is especially important if your have first dinner. Otherwise you may have to miss out on part or all of dinner to get your makeover done. Don’t wait until you are on the ship to schedule Pirates League. Instead book it online when you are choosing your other cruise activities such as scheduled character meet and greets, spa treatments, or excursions. Scheduling ahead of time gives you the largest number of appointment time options. Unlike setting up for a Disney parade you don’t have to arrive that early to secure a good viewing spot. At 7:30pm we were still able to grab off-center seats pretty close to the stage for Mickey’s Pirates in the Caribbean. I really like this show and enjoy being close to the action. We were running late to Buccaneer Blast after second seating dinner on our most recent trip. I rushed upstairs and grabbed a good spot to watch the live show on the starboard side of the stage, but I forgot all about the firework viewing. The fireworks are launched over the starboard side of the ship. For those who don’t speak boat that means on the right side of the ship if you are facing front. We were able to see the fireworks, but had a obstructed view because of the AquaDuck tubing. 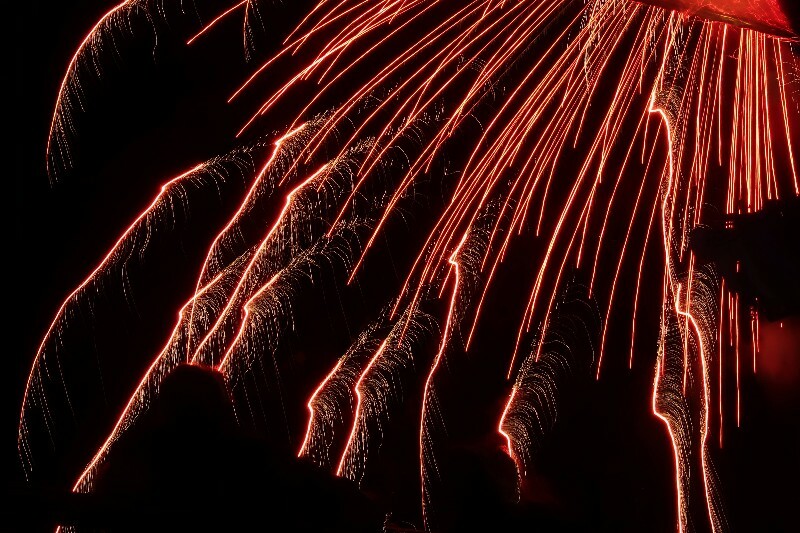 For the best fireworks view grab a spot on the port side of the boat. 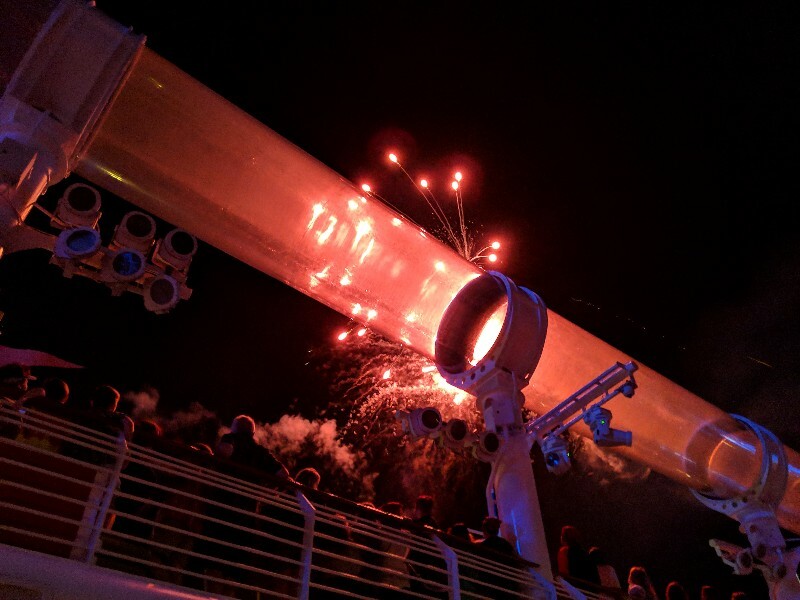 The best pirate night fireworks viewing spot is probably port side on the upper deck, but then the view of the live show isn’t as good. Just remember to pick port side (left side of boat when facing forward) and you’ll be in good shape for fireworks viewing. I think this is the most important part of a Disney Cruise Pirate Night. People are generally in a good mood and have a lot of fun on Pirate Night. Do what makes you feel comfortable with costume and make-up. The main thing is to just go out and have a great time with these special activities. My only words of caution are this: if you want to be off the boat early the next morning, don’t stay out partying too late. We always see parents and kids struggling on the morning after Pirate Night. And generally the entire port day after can be a challenge if everyone is tired. Know yourself and your family to choose the right level of Pirate Night party for you. I think the reason people love Pirate Night so much is that it is a chance for everyone to be a bit of a kid for the night. People are in a good mood and the feeling of fun is infectious. The live shows, fireworks, Club Pirate, and late night buffet keep the Pirate Night fun going for hours. I really enjoy this special Disney Cruise event on our Caribbean cruises and I hope you do, too! 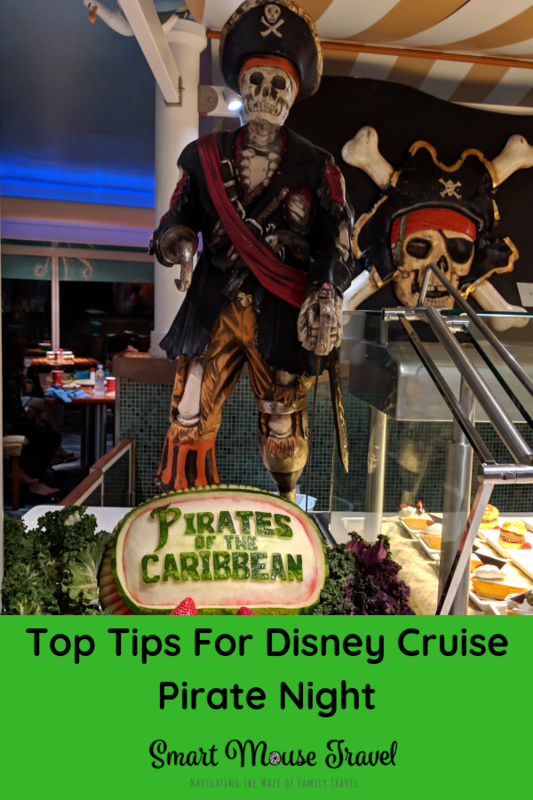 Find more of our Disney Cruise tips here.